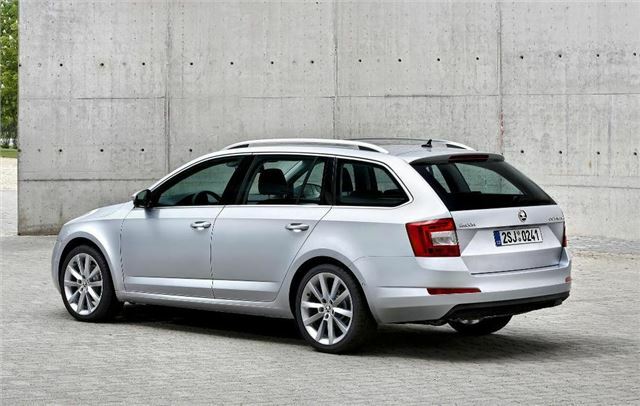 Skoda has announced prices and specifications for the new Octavia Estate, which is being shown at the Geneva Motor Show. The entry-level 1.2-litre model will start at £16,790 when it goes on sale in the UK in June, rising to £24,040 for the top 2.0-litre diesel model. It will be a 13-model range and will continue with Skoda's familiar and easy-to-understand S, SE and Elegance trim lines. The premium over the hatchback will be £800. Four engines have been lined up to power the Octavia estate, with two petrols and two dieselsPower outputs range from 105PS (1.2 TSI, 1.6 TDI CR) to 150PS for the 2.0 TDI 150PS model. Skoda claims that these engines are up to 17% more economical than those in the old car and promises that a Greenline version will appear later in 2013, boasting emissions of just 87 g/km. The Octavia estate has also grown a little over its predecessor. At 4.66 metres long, it's 90 mm longer than the old one and at 1.81 metres (excluding side mirrors); it is also 45 mm wider. The boot has grown by 20 litres and is now 610 litres with the seats up and 1,740 litres with the rear seats down. With the front passenger seat folded down the car will carry objects up to 2.92 metres in length. The usual range of ‘Simply Clever’ features is present, like a reversible boot floor, door-pocket bin and built-in ice scraper behind the fuel filler flap. There are a few new touches, too, like a remote fold function for the rear headrests and a built in coat rack. As with the hatchback, there’s a host of technologies to improve safety, including City Emergency Braking and fatigue detection. For those who demand extra stability and reassurance in slippery conditions, there’s to be a 4x4 version, which will be present at the Geneva Motor Show.